Every fine wine is a product of person and place. For the wines of Pousse d’Or, that person is Patrick Landanger; proprietor, vigneron, innovator. 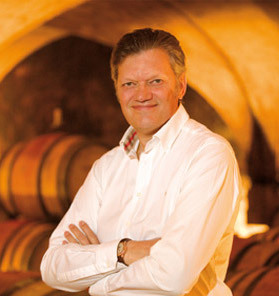 Landanger had almost no experience with the wine business when he bought the estate in 1997 just after longtime share holder/founder Gerard Potel died suddenly of a heart attack. He quickly jumped in with both feet. The places are the cellars of the Pousse d’Or domaine in Volnay and its estate vineyards in Santenay, Puligny, Volnay, Corton, Chambolle, and Morey. The domaine name is spelled Pousse d’Or (with a P) rather than Bousse d’Or (with a B) as the French authorities would not let them call the domaine by the exact name of a vineyard as in “Clos de la Bousse d’Or” which is itself a monopole of the domaine. Viewed from the road that runs below (southeast of) the town of Volnay, the Pousse d’Or estate dominates the scene. 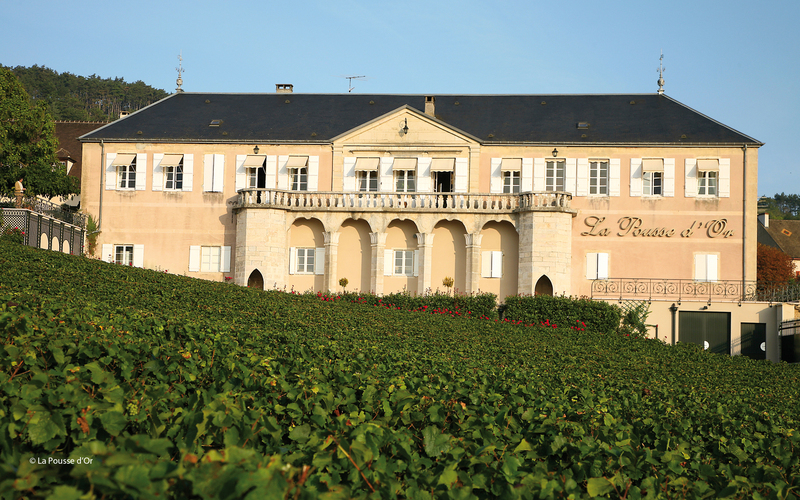 In an area of mostly small but spread out holdings, Pousse d’Or stands out as a well-funded, well-maintained, grand estate like few other domaines in all of the Cote d’Or. There is a grand house and fine winery buildings with deep cellars, all built on and into a hillside rising up from the road to town of Volnay. Vineyards include land in Santenay, Puligny, Pommard, four very favored 1er cru plots in Volnay, two in Corton Grand Cru, five 1er cru plus some village in Chambole and not-quite-an-acre of Clos de la Roche Grand Cru in Morey. The Chambolle and Morey parts of the domaine were added in 2008 but no wine was made as that new vineyard was in sad shape. The 2009s were fine and the wines have been improving since. While the Domaine de la Pousse d’Or was established as a dominae in 1954, some of its vineyards can be traced back to the Dukes of Burgundy and the year 1100. According to historians, the wines were already known in the 4th century. 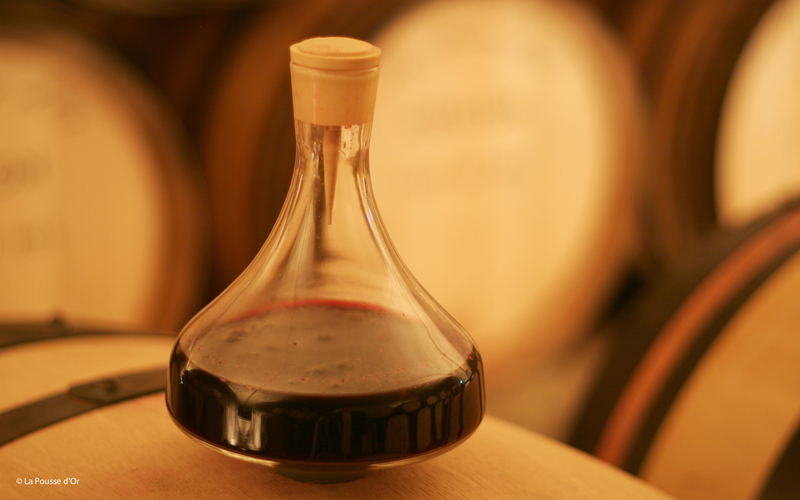 Pousse d’Or was already well known as a producer of top Volnay wines in the 1970s and 1980s. Since he bought the domaine in 1997, owner Patrick Landanger has invested heavily both in the vineyards and in the technical facilities. According to the domaine, “No pesticides are sprayed on the vines and only organic fertilizers are used. The land is ploughed to aerate and enrich the soil, and weed killers are avoided.” This is not the easiest or least expensive way to farm but it yields the great fruit that makes great wine. Since Patrick Lananger took over, he has added to the domaine (which used to be all in the Cote de Beaune) with new vineyards in Chambolle-Musigny and Morey-St. Denis in the Cote de Nuits. In the cellars, the handpicked 100% Pinot Noir grapes are sorted and de-stemmed before going in to open topped wooden and stainless steel vats where they are given a 7 day cold soak before fermentations utilizing mostly punch downs with some pump-overs for cap management. After about 21 days of total skin contact, the new wine is moved to barrels where it undergoes malo-lactic fermentation and aging for as long as 18 months. During barrel aging, the domaine uses a unique device invented by the owner to monitor and keep all the barrels filled to the optimum level. All rackings are done using gravity flow, as is the bottling. All the wines are bottled with fining or filtration. Pousse d’Or is one of the top domaines in Burgundy. They are doing everything right with the terroirs, the resources, and the will to make top wines. The wines are fresh and exciting and generally hold your attention without commanding it. Given the quality of what Landanger is doing, the prices are more than fair. I love drinking these wines. 100% Pinot Noir fermented in open tops with both punch-downs and pump-overs and aged in French oak barrels (33% new ). Red-violet color with well formed legs; dry, medium full-bodied with freshly acidity and medium phenolics. Spicy dark red fruit with mineral earth and cola. Precise, top tier Santenay Yum. BearScore: 92. 100% Pinot Noir. Fermented in open tops (and a couple of Amphora) with both punch-downs and pump-overs and aged in French oak barrels (33% new) and (a small percentage) in clay amphoras. Red-violet color with well formed legs; dry, medium full-bodied with freshly balanced acidity and medium phenolics. Mineral and vivid red fruit with perfume and spice. Delicious. BearScore: 92+. 100% Pinot Noir fermented in open tops with both punch-downs and pump-overs and aged in French oak barrels (33% new). Red-violet in color, and with well formed legs; dry, medium-bodied with freshly balanced acidity; medium phenolics. Supple, fresh, alive. Still fairly rich. Dark and darker red fruit but still showing mineral and perfume. BearScore: 94+. 100% Pinot Noir fermented in open tops with both punch-downs and pump-overs and aged in French oak barrels (33% new). Red-violet in color, and with ; dry, medium full-bodied with freshly balanced acidity; medium phenolics. Perfumed yet big and serious. Dark, juicy ripe red with red and darker red fruit, cola, and mineral earth. Delicious. BearScore: 94+. 100% Pinot Noir from next to Volnay fermented in open tops with both punch-downs and pump-overs and aged in French oak barrels (33% new). Red-violet in color with well-formed legs; dry, medium full-bodied with freshly balanced acidity and medium phenolics. Supple softer darker red fruit with spice and perfume. Integrated oak and mineral. Seductive and delicious. Already drinking. BearScore: 94. 100% Pinot Noir aged in all French oak barrels (40% new). Red-violet in color, and with well formed legs; dry, medium full-bodied with freshly balanced acidity; medium phenolics. Real depth and power. Lurking. Supple dark and darker red fruit with mineral earth and layered dark spice-oak-cola. Has the grand cru breadth and the power of Corton. BearScore: 96. 100% Pinot Noir from 7 village plots and 2 tiny 1er cru plots fermented in open tops with both punchdowns and pumpovers and aged in French oak barrels (25% new ). Red-violet color with well formed legs; dry, medium-full-bodied with freshly balanced acidity and medium phenolics. Supple, fresh darker red fruit with perfume, spice and cola. Quite mineral. BearScore: 93+. 100% Pinot Noir aged in French oak barrels (33% new). Red-violet color with well-formed legs; dry, medium full-bodied with freshly balanced acidity and medium phenolics. Supple, fresh, juicy ripe but still offering elegance and even some delicacy. Thrilling in the mouth. BearScore: 94. 100% Pinot Noir aged in French oak barrels (33% new). Red-violet in color, and with well formed legs; dry, medium full-bodied with softly balanced acidity and medium phenolics. Lovely fresh yet supple red with fine tension. Sweet darker red fruit with perfume and spice. YUM. BearScore: 94+. 100% Pinot Noir aged in French oak barrels (33% new). Red-violet in color, and with well formed legs; dry, medium full-bodied with freshly balanced acidity and medium plus phenolics. Bigger and riper with real depth. Still a bit tight still but the layers are all there. Dark and darker red fruit with earthy mineral, spice, and cola. Exotic BearScore: 96. 100% Pinot Noir fermented in open tops with both punch-downs and pump-overs and aged in French oak barrels (40% new). Red-violet in color, and with well formed legs; dry, medium full-bodied with freshly balanced acidity and medium plus phenolics. Deep and dimensional with dark and darker red fruit and spice. Supple feel fills the palate and finishes in waves. BearScore: 96+. 100% Chardonnay fermented in 350 liter French oak barrels (18% new). Straw with green highlights and well-formed legs; dry, medium full-bodied with freshly balanced acidity and scant phenolics. Classic Puligny elevated to top level 1er cru. Tension. Mineral. Fruit. Perfume. Thrilling in the mouth. Elegant and alive. WOW. BearScore: 95.